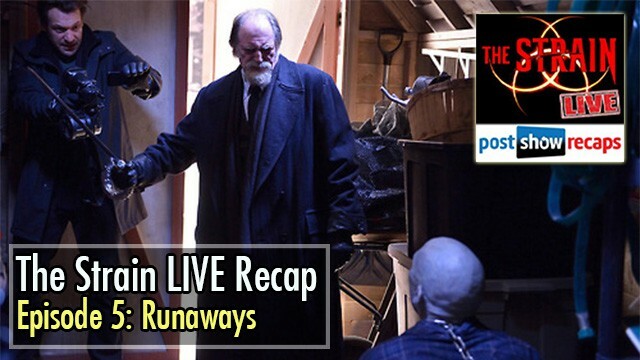 On this recap, recorded LIVE on Sunday, August 10th, Josh Wigler (@RoundHoward) is joined by co-host, Antonio Mazzaro (@ACMazzaro), to recap episode 5 of The Strain: “Runaways”. Josh Wigler is joined tonight by Antonio Mazzaro. Josh thinks the show is starting to get real here. 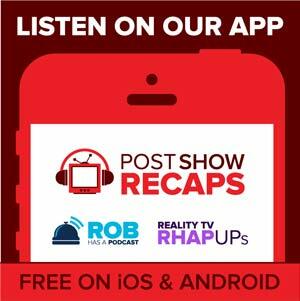 Unfortunately, Rob can no longer do recaps for the Strain moving forward in order to accommodate Big Brother over RHAP. They do hope this becomes a smooth transition though. Antonio says he’s on the Strain Train. Some vampire killing is what he wants to see. It’s great that Eph and Abraham are finally getting together for some vampire-slaying action. Corey Stoll with a nailgun is not so bad. The Wigler Wig Watch: They hope Corey is putting the hat on for the rest of the show. Josh is pretty down with the wig this week, saying it’s worse than it was last week especially in the scene at the end of the episode during Eph and Jim Kent’s scene. Unfortunately, it was so clear it was a wig. Hopefully, he will shave his head off eventually. Is it possible it’s because he’s gonna go smooth? Is he the character who can still hang on to his humanity? We’ll see. Which is a better weapon – nail gun vs. chain sword? Josh thinks there might be something more about the sword. Antonio would go for the sword. At this point, Josh is scared getting close to any vampires. He thinks the nail gun isn’t gonna kill anybody and not a lethal weapon against these vampires. Josh says Antonio cannot count on him and he might point the nail gun to his head before any vampire could attack him. He would be the last guy you could count on when it’s the end of the world. But then Antonio offered him some pizza and Josh says he’s coming back in without any hesitation at all. What Antonio thinks is making this show interesting is that aside from the unique kind of vampires which is nothing like those in other shows, he likes how this is being a coordinated campaign to really spread the virus. It’s planned and purposeful. Josh thinks Eichorst is not just dangerous for being a vampire but because he has a silver tongue. The monster thing is a witty, sharp, dangerous-thinking creature as well and Abraham spells that out tonight. The flashbacks of Abraham back in 1944 with Eichorst there – Antonio thinks we’re definitely not done here. Josh thinks this is the Chapter 1 in the story showing Abraham’s history with the vampires which is barely a taste. He wonders if this is going to be a big storyline. We don’t get much elaboration on Eichorst though. Although we can conclude here that Eichorst definitely hasn’t become a vampire here yet seeing that he could stay out in broad daylight. But he could be working with the vampires. At this point, not enough information is being divulged yet. Josh is fascinated with what Abraham revealed in the modern day that silver affects them since it’s the weakness of the werewolves. So there might be more in the can here. What’s for sure is that their expectations are being flipped. The Master manipulating things as an explanation as to why the four survived the flight which is for disinformation purposes is good. Antonio appreciates this. He likes how they are building the Master up into something. Ansel’s wife killing herself came as a surprise though. Antonio explains what’s the deal with the silver mirrors. Finishing off Eph’s storyline, Josh likes the scene under the shed when Eph goes in with the camera phone out and he’s shaking. He thinks it is so 2014. That is definitely what you would do in the modern day vampire world. Vampire may just go into doing selfies as well. So Eph records the assault against Ansel and it’s a surprise Ansel is gone too soon. What bugs Josh is that when Eph brings the video to his boss in the headquarters and then basically calls security and gets Eph arrested. Antonio likes this for being true to reality with a lot of bureaucracy involved. Here’s what’s interesting, the captain’s head didn’t get cut off nor was it set on fire. So who knows what’s gonna happen next? Dr. Everett Barnes is acting weird in this episode and there is a possibility that he’s a mole. At the old folk’s home with Nora and her mom. Josh says the storyline was kind of the snoozer of the night until there are vampire’s seen there, or rather “grandpires.” This goes to show that the virus is really spreading quickly. Josh is also disappointed with Vasiliy, rat-exterminator extraordinaire, expecting that he would’ve killed the vampires in the sewers but he runs away instead. He is looking forward to see Vasiliy hooking up with our heroes and get his full story. Joan seems to be slowly progressing compared to Gabe. So show people might be changing at different rates. For now, she still hasn’t lost her hair or her genitalia either. Josh thinks the way vampires eat people on the show is really nasty. Antonio doesn’t want to be part of that either. Every time the vampire’s tongue comes out, Josh is definitely happy. To cap it off, Josh and Antonio are happy with how the show is going.